During Ramadan, one of the local TV channels presented a daily show on which celebrities were invited to cook a dish while being interviewed. It was interesting observing people you would normally see performing their celebrity-yielding professions handling food. But I could hardly claim any of the dishes that were presented during the month-long show as inspiring. Only one dish intrigued me. 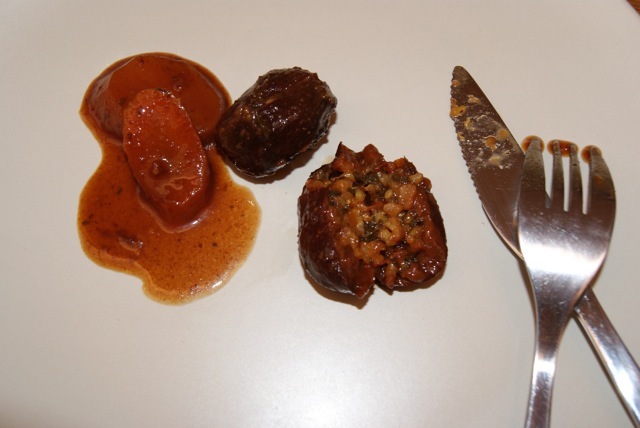 Stuffed prunes presented by Nabila Al-Anjari. While watching the show, I wasn’t able to write down the recipe or take note of the cooking method. Fortunately, a dear friend happens to know the celebrity guest and I asked her to kindly get the recipe. The request was passed on, and I got a surprise call from Ms. Al-Anjari generously offering to send her personal chef, Raji, to cook the dish at my house. As there were no precise measurements for the ingredients, I took notes while I watched her prepare. I experimented with the recipe a few times until I got it down to the exact desired measurements and taste, and modified the cooking method. This dish is great served slightly warm as a side for roasted lamb or as a light meal with yoghurt and green salad. For those who like a kick to their food, hot sauce works great with it as the spiciness balances out the sweetness of the prunes. Mind you, you will end up with extra rice filling. Make some stuffed cabbage rolls! So here goes, stuffed prunes. 1- Soak the rice for half an hour, and then fully cook in salted water. 2- Pour some oil in a small bowl. 4- Dip your thumb, forefinger and middle finger in the oil and remove the pits by carefully pulling the pit away from the flesh. Then, with your thumb in the inside of the prune and the forefinger and middle finger on the outside, carefully press the wall of the prune while circulating the prune with your fingers to turn them into ‘little bowls’. 5- Dilute the tamarind and ½ teaspoon salt in 4 cups warm water, then strain from seeds. 8- Finely chop the coriander, mint and parsley. 9- Cover the bottom of a medium sized pot with the potatoes. 10- Place carrots over potatoes. 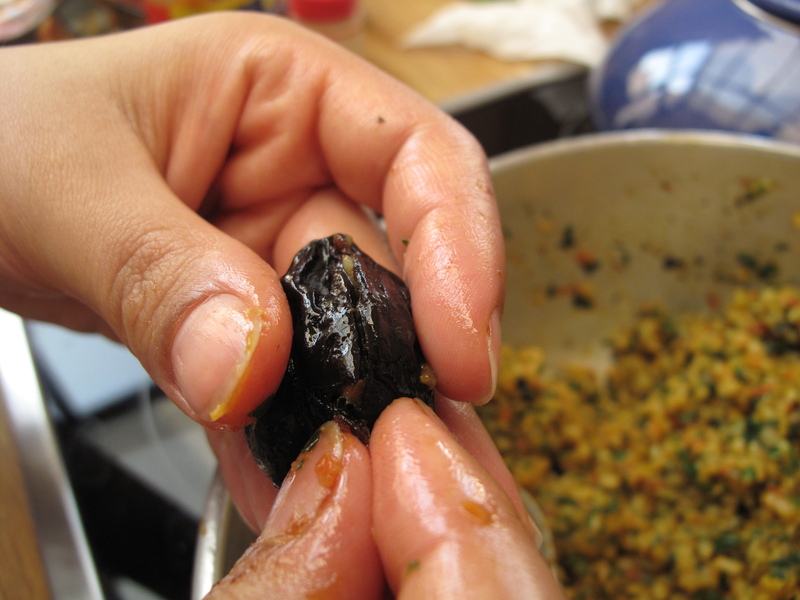 1- Stuff prunes with rice filling and ‘seal’ the slit by squeezing the prune gently between the palm of your hand and your fingers. The rice needs to be sealed in so the rice doesn’t spill out during cooking. 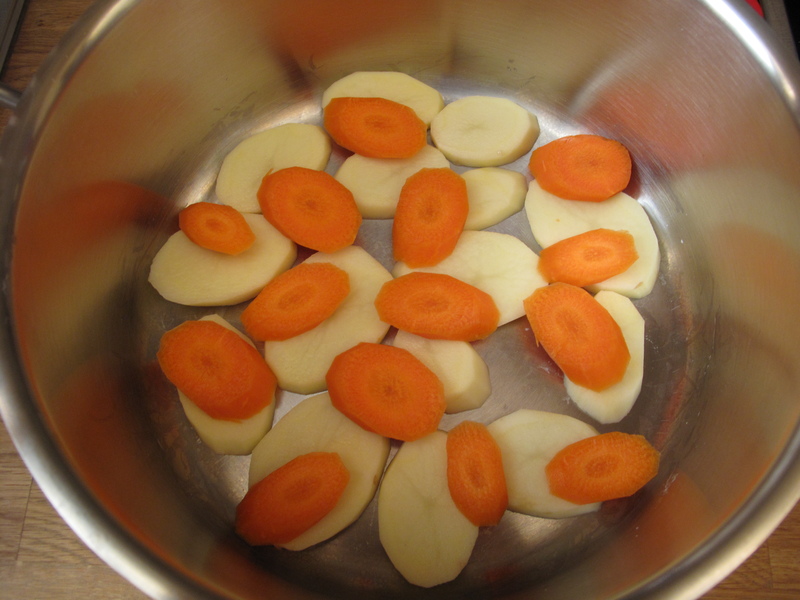 2- Place the prunes one by one over the carrots in a circular form. You should end up with at least 2 layers of the stuffed prunes. 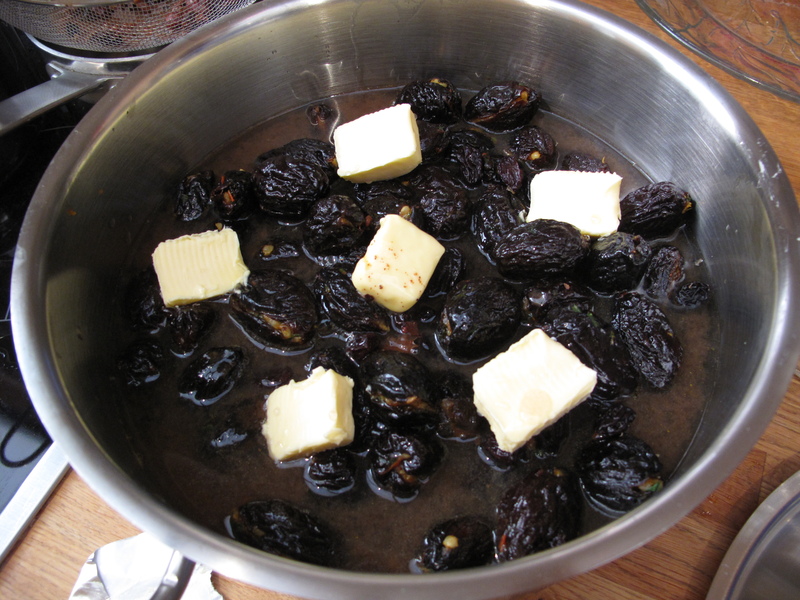 Note: Place the prunes slightly apart as they will swell during cooking. 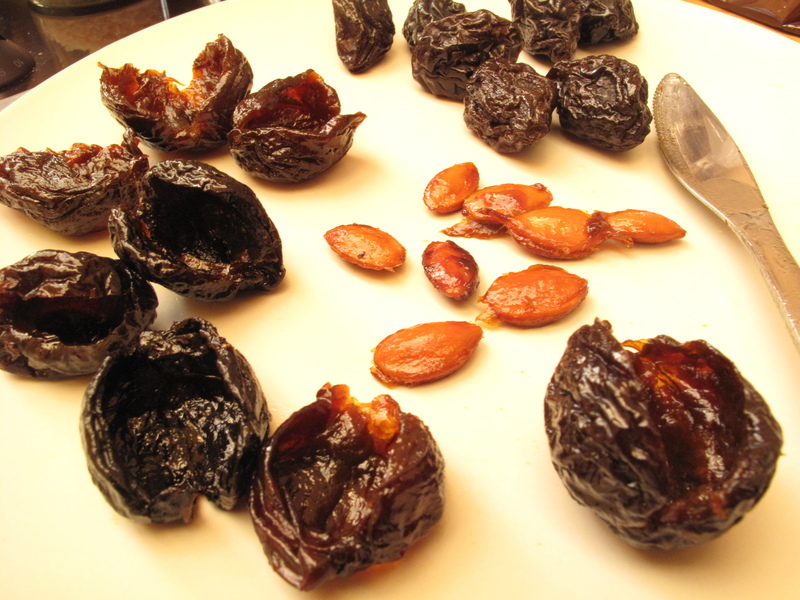 5- Place a plate facedown over the prunes to keep them pressed down during cooking. 8- Allow to continue cooking slowly on very low heat until the sauce has slightly thickened, approx. 45 minutes. 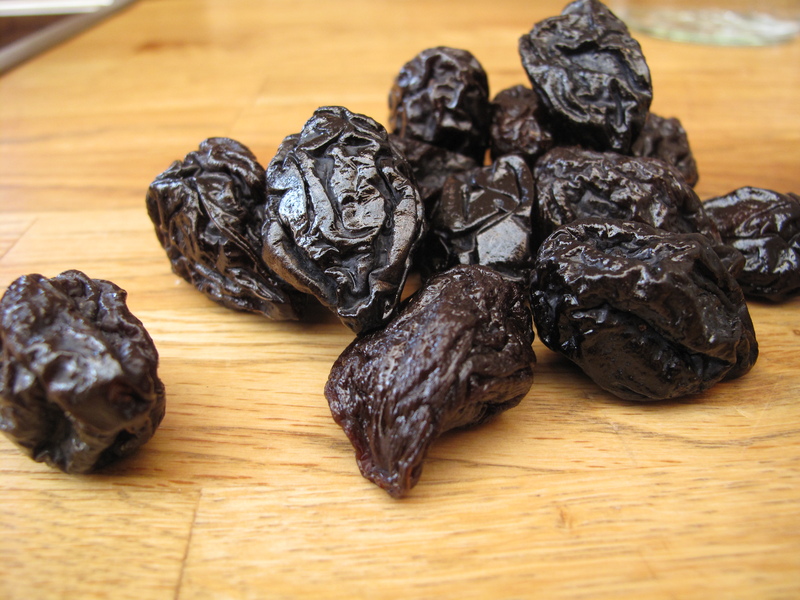 10- Allow the prunes to cool in the pot to slightly above room temperature. 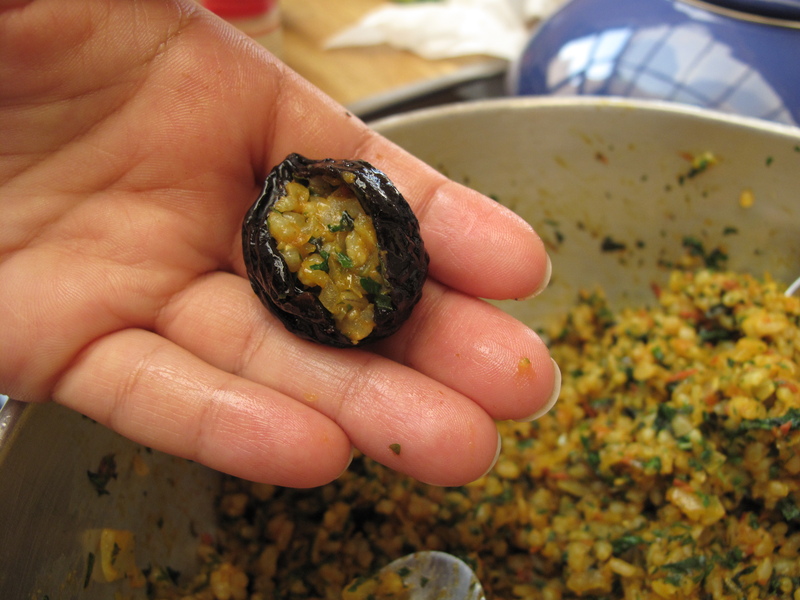 This entry was posted in Experiments and tagged prunes, recipe, rice filling, stuffed by Besma at Life Demiraged. Bookmark the permalink. To validate this recipe, I’ve had the pleasure of tasting it (thank you guest writer for the “neg9a”) & it was absolutely FAB!